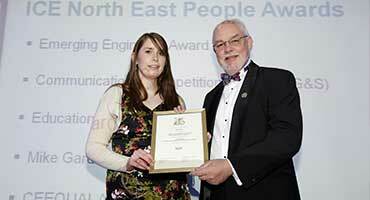 ICE North East runs a number of awards and competitions to promote and celebrate civil engineering across the region. They recognise the projects that members work on and examples of outstanding individual achievement. 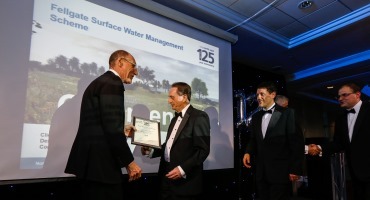 ICE North East presents the Robert Stephenson Awards every year as a celebration of civil engineering excellence in the region. The awards ensure projects receive the acknowledgement and prestige they deserve. The results are announced at the annual dinner and awards are presented by the ICE president. ICE North East also gives and supports a number of awards that showcase the individual expertise and excellence of members. Find out more about the awards and how you can enter. Become ICE Regional Ambassador for 2020 (providing a 'money can't buy' prize that greatly increases the profile and contacts of the winner). Entries from the North East region will showcase their talent and creativity in a 200 second presentation in Newcastle. The winner, selected by a panel of expert judges will become the North East Regional Ambassador for 2020 and represent the region at the Grand Final in autumn. Interested in entering the competition? Please complete the entry form and return by to [email protected] by 26 April. The regional Pitch 200 is open to all current ICE members who study, live or work in the North East region. This annual competition, formerly known as the Papers Competition, promotes and rewards excellent communication of civil engineering issues and ideas. The North East regional heat is open to all current ICE graduate and student members who live, work or study in the region. Watch this space for more details about the North East competition. Graduate and student members can submit papers on any areas of engineering design, research or practice. Entries can be adapted from undergraduate research papers, university projects, professional development or professional review reports. It's preferable for papers to be based on work done by the applicant, or that they were involved in. The judging panel is made up of experts from across the region with wide experience and knowledge. The judges will select from the entries submitted and finalists will be invited to submit their full paper and to present it at the regional final in Newcastle. The regional winner may be shortlisted for the national final where a top prize of £1,500 and an Institution Medal can be won.